Firstly, the art and illustrations. I believe the age of the book lends to this especially, and Sal Murdocca (the book illustrator) did an excellent job with the attire, scenes and figures. The images are easy to look at in grayscale and not confusing, and carry their point across well. This was also a big point for me, as most storybooks about time travel were just walltext (my shorthand for a more novel-like book with no illustration). This is also evident on the cover, and is what drew me to the book in the first place. I will confess that its an entertaining thought to cross over different periods, especially dealing with the Civil War period (it probably stems from the movie The Love Letter). This cover popped out to me right away, especially seeing Jack and Annie in period costumes (most of the time the few crossovers I had seen were people in modern clothing). That setup is what made me pick up the book in the first place. Storywise its a simple and concise story. Camelot’s in trouble, and they’re supposed to find four pieces of writing (something to follow, send, learn and lend). Whisking themselves back to the Civil War period, Jack and Annie walk into a Union field hospital and get involved helping the soldiers. They eventually get their piece of writing (the follow clue), which is a list of things to follow written by no other than Clara Barton. They eventually meet this historic nurse, and trek their way home after learning about a lot of aspects about the war. Despite all those years later, I never bought the book for myself. Years went by till I found out that there was an anime adaptation, which included Japanese versions of some of the books. 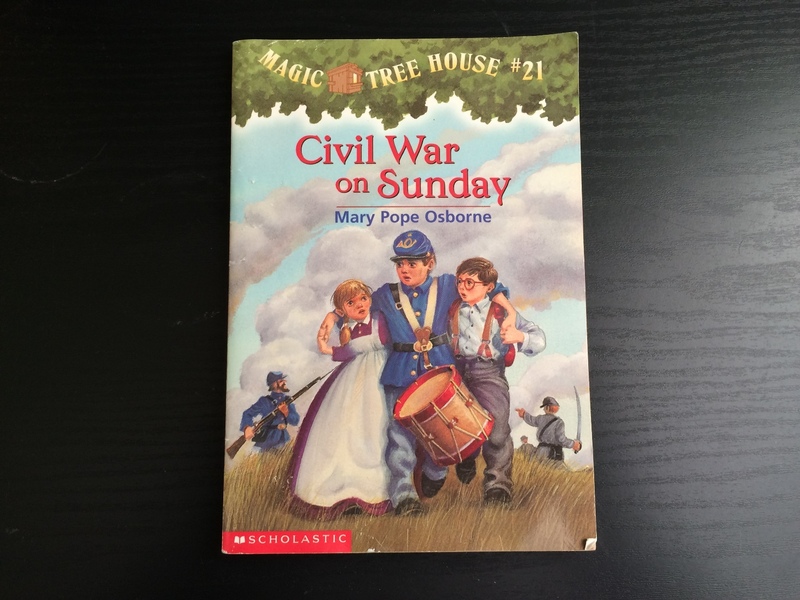 The Civil War one was one of the books that had been translated, including a whole host of different pictures. I found a copy on Amazon and proceeded to order it. Unfortunately, the vendor has mislabeled it, and it turned out to be the American version. Oh well, my loss. I was allowed to keep the copy for free, and I resumed my hunt to find a Japanese version of the book once more. In closing, great book series; and this particular book is no exception. Even for a 29 year old guy who plays things like Homeworld: Deserts of Kharak and Supreme Commander. Makes me wonder about my younger self and the imagination I would have. Definitely would give a kid to read this. This book also exists in eBook format, which is one of the methods I score books. I wholly agree that eBook versions should exist of a print book; this makes it a lot more accessible for various reading audiences. As such, it passes that mark with muster.